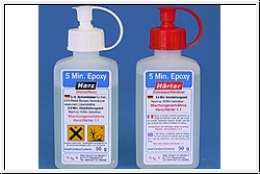 Fast-setting, solvent and filler 2-component epoxy resin adhesive of honey-like viscosity. Very suitable for wood, metal, stone, rigid foams, and many plastics. This Product was added to our catalogue on Saturday, 14. March 2009.